We have a nice range of promotional beach products here at Calendar Lady Promotions and one of these excellent and vital products for the beach is our Classic Beach Balls With Logo. Each beach ball is a classic two tone white/coloured beach ball ready and waiting to have your business details and company logo printed on. So every time you go to the beach and play ball, your advert will speak out load and proud. And remember, you could be at any beach anywhere around the world. So give away our Classic Beach Balls With Logo to your customers and friends so every time they make it to the beach, there will be more adverts for your company. 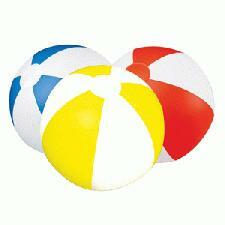 So promote your business details and logo upon our Classic Beach Balls With Logo this summer! Available in Blue, red and yellow. To find out more about our Classic Beach Balls With Logo click here and fill in the contact form and we'll get straight back to you. Other promotional and personalised items besides our Classic Beach Balls With Logo click here.